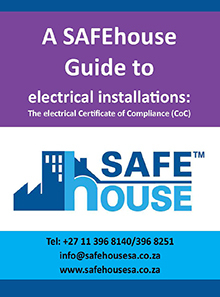 SAFEhouse has published a Guide to electrical installations: The electrical Certificate of Compliance (CoC). The CoC was introduced in South Africa in 1993, coinciding with the national registration of electrical contractors, which replaced annual registration at individual municipalities. The CoC, properly completed, is vital as an assurance of regulatory compliance and protection of occupiers of premises against electrocution and damage to assets. This guide offers a step by step outline to fulfilling it in correctly.